The tumultuous month in the life and times of Atlantic City Mayor Frank Gilliam just got more interesting. The gaming resort city’s embattled leader — already facing backlash for his involvement in a November tussle outside the Golden Nugget casino that was caught on video — was on the receiving end of a home raid by the FBI and the IRS on Monday morning, according to multiple reports and later confirmed by the FBI. A video taken by a local NBC affiliate reporter and posted on Twitter shows federal agents removing electronic equipment from Gilliam’s home Monday morning. 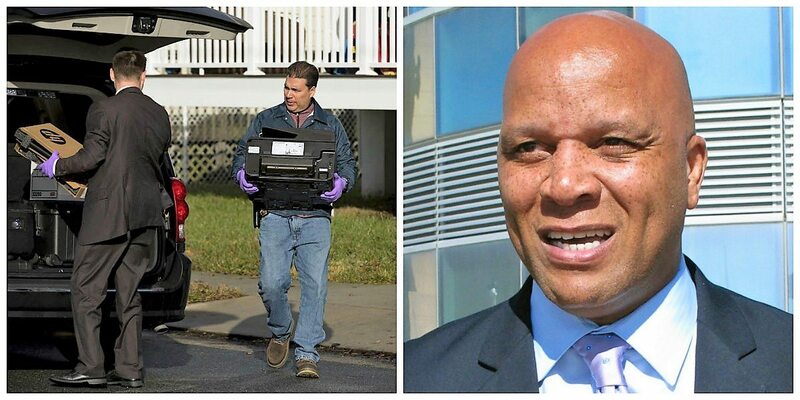 In a second video, Gilliam appears to leave his home after the completion of the raid without speaking to reporters. FBI agent Jessica Weisman confirmed to reporters at the scene that the raid was being conducted by both the FBI and IRS, adding “that is all we can say, no further comment,” according to the Philadelphia Inquirer. In most cases, the question of “why are federal agents raiding the mayor’s home?” might seem like it would have an obvious answer, but Gilliam’s actions since being elected last year make the question far from pat. For starters, the raid of his home Monday morning comes just eight days before his scheduled Dec. 11 appearance in court to discuss his involvement in a brawl outside the Golden Nugget casino in November. Gilliam and Atlantic City Councilman Jeffree Fauntleroy were both involved in a fight outside the casino on November 11. The two will not face criminal charges, but Gilliam received two summonses for simple assault and one for harassment for his involvement. And it wasn’t the first face-off for Hizzoner, either. Late in 2010 — then an at-large Atlantic City councilman — Gilliam and another man filed charges against each other following a physical altercation. After the November fight, the Atlantic City Democratic Committee voted 27-3, imploring New Jersey Governor Phil Murphy and Lt. Governor Sheila Oliver to “temporarily suspend and remove both immediately from their positions without pay,” until legal proceedings stemming from the brawl have run its course. That wasn’t the first mutinous action taken against Gilliam since being elected in 2017, either. Gilliam was the subject of a criminal complaint filed by members of his own party who alleged the Democratic mayor deposited a $10,000 check meant for the Atlantic City Democratic Committee into his own account. He called it an error and said he corrected it as soon as he found out the money had somehow made its way into his account. The complaint was filed in March, but a New Jersey Superior Court judge dismissed it just weeks later, in early April, saying there was no probable cause to believe Gilliam stole the check. “The Court cannot find any basis to credit that it was the purpose of either Mr. Gilliam or Mr. Winstead to deprive permanently or for so extended a period either the Atlantic County Democratic Committee or the Atlantic City Democratic Committee of the benefit, use, or possession of the check or its proceeds,” Judge Bernard DeLury wrote in his decision to dismiss the complaint. Gilliam’s former campaign manager Richard Winstead was also the subject of the complaint. Despite the judge’s decision, John Devlin — the committee member who filed the complaint against Gilliam and Winstead — said multiple allegations of Gilliam misusing campaign cash are “starting to grow arms and legs and ears,” and said he was considering additional civil action against the mayor, according to a news report by the Observer. At the time, the FBI’s Weisman neither confirmed nor denied that the Bureau had investigated Gilliam’s alleged misuse of the $10,000 check. The post Feds Raid Home of Atlantic City Mayor Frank Gilliam One Week Before Scheduled Court Appearance for Casino Brawl appeared first on Casino.org.